DeSoto County is named for the Spanish explorer Hernando DeSoto. It was created from Manatee County in 1887. Until 1921 DeSoto was one of the largest counties in the state, but residents complained of the vast distances between home and courthouse and it was subdivided to create Hardee, Charlotte, Highlands, and Glades Counties. 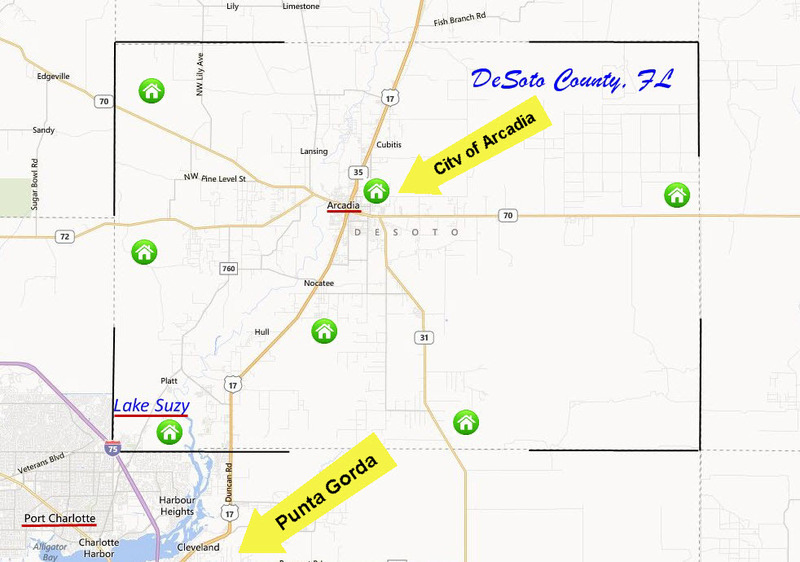 The original DeSoto County seat, which had also served Manatee County since 1866, was located at Pine Level. Although apparently built of brick, the Pine Level courthouse, or at least its jail, was derided as “flimsy,” allowing the escape of prisoners to such an extent that vigilantism was rampant in the large and undeveloped county. Ghost town researcher James Warnke has located the site of this structure but reports that only a few bricks remain beneath the shade of an oak hammock. Eventually, a new county seat was created at “Tater Hill Bluff,” renamed Arcadia, in 1888. Arcadia Albritton was the pretty daughter of local settlers. The first courthouse in Arcadia was constructed by Peyton Read at a cost of $6,000, half of which had been donated to the county by four local citizens. It is probable that this structure was destroyed in a 1905 fire since historian Louise Frisbie reports only three brick buildings survived that conflagration. The current DeSoto County Courthouse was built by the Read-Parker Construction Company in 1912-13. It was designed by the Tampa architectural firm of Bonfoey and Elliot. In the late 1870’s, the railroads were completed through Desoto County and it changed the growth of the county and brought wealth for many. In 1881, phosphate was discovered on the banks of Peace River that flows through the county. Mining of this mineral brought much prosperity for many years. Ruins of the old phosphate docks can be found today near Liverpool on Hunter Creek, just a few hundred yards from the Peace River in South DeSoto County. MLS Detectives Group - LOOK NO FURTHER! Beautiful 1 +/- acre tract with highway 17 frontage, the property is zoned AG with nice trees. Additional parcel available for purchase.